It’s been a while since I’ve posted some free printables on here. So today I’m making it a two-for-one! Last Friday at my office we hosted a baby shower for a coworker. Before the adorable little conference room shower, I got a call from the coworker throwing the shower that we needed some party games, and since I sit on the Communications team and do a lot with design, I was tasked with the project. 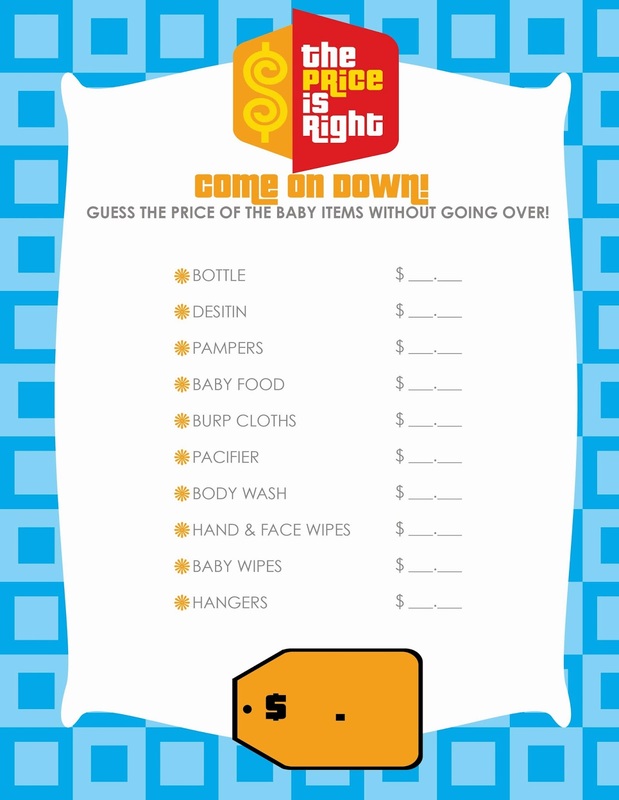 I decided to make a baby game based off The Price is Right. In this game, a shower host buys a variety of products (a baby bottle, pacifier, baby food, diapers, wipes, etc) and displays them out on a table. Everyone at the shower then gets a game card. The shower host holds up each item on the table like a Price is Right model while each party guest guesses the retail price of each item. After each item is presented, each party guest tallies up the total amount of the products and the guest with the price closest to the actual retail price without going over wins! An editable PowerPoint version is now available below. Edit the items on your game cards and price tags and save as a PDF for easy printing. At this time, I am unable to accommodate any requests to customize this printable for your party. Thank you for thinking of me, and I appreciate your understanding! Use this game in your recent shower? Send me a photo via Instagram #allyjeanblog I’d love to see it! Not a free download. Looks great though! I’ve tried embedding the documents into this post so they can be downloaded directly without (hopefully) needing an account. Hello, I’m hosting a baby shower for my SIL I would love to play this with guest. Hi Ally Jean! This is the best template I have seen so far! You did such a great job! Is there any way you can send this to me via email? I would like to add a few more items in the game, but I need this document in a word or publisher document! Love this! Would like to use this for a shower I am giving- but need to change a few items… can you email me the file so I can edit?? It would be greatly appreciated! Nice work!! I apologize for the delay in getting back to you! I’ve updated the post with an editable PowerPoint template for your convenience. This is absolutely great, I love it. Can it be edited to change one or two items, can you email file in word doc? I was wondering if this is still available? I downloaded for editing but no images display…. I can’t edit the price tags. Am I doing something wrong? Or can you upload and editable file for the tags? Thanks!! Hi there! I’m working on this now. Because the font used for the other price tags is custom, I’m working on providing you (and all my other eager readers!) with a completely editable template for price tags. Hang in there! I hope to have the template up before the end of the month. Thanks for reading! Great! I am using this for a baby shower this weekend. Will you have the editable tags up soon? If not, I can just print blank ones and write on them. Thanks for this! Super cute. I am going to use this for a baby shower this Saturday. Any chance the editable tags will be available before then? Thanks for this awesome template!! Hi, I love your design. I downloaded the editable version, and I did figure out how to change the items, but I couldn’t figure out how to delete items all together. I have 7 items I want the guests to guess and yours has space for 10. I love what you have created! It is adorable! I would love to use it for a shower this Saturday but I am having trouble downloading it. Is there a way you could email it to me? I don’t need to edit it. It is perfect for what I need. My computer is telling me I don’t have a program to download the editable version and when I download the other version it won’t print. Anyway, if you have time I would love it! Thank you so much! 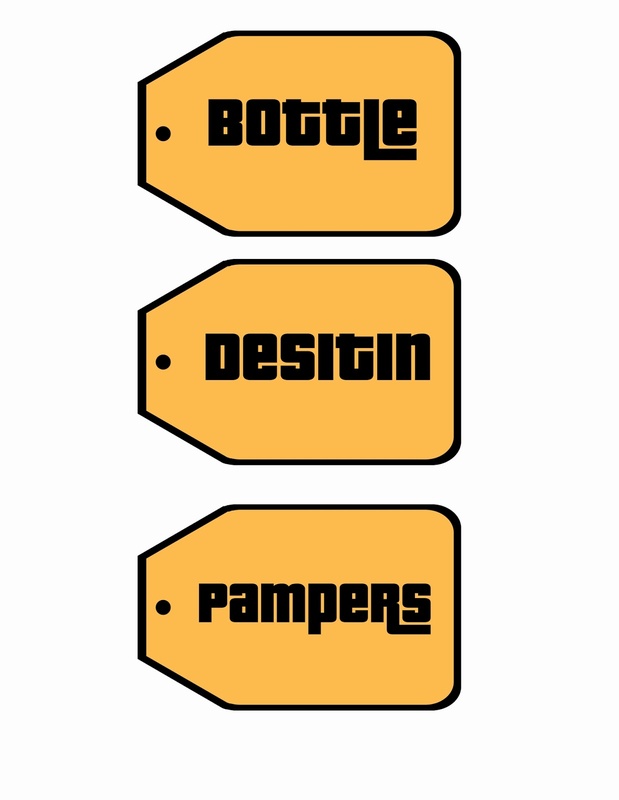 WHAT IS THE FONT USED ON THE PRICE TAG STICKERS? THANKS! Oh my gosh!!! Thank you so much – having a baby shower for my son’s math teacher, Mrs. Price, tomorrow and this is perfect! You just saved me so much time! Thanks for helping a working mom out today – super cute and I appreciate so much that you shared this for free and made it editable – so nice of you! I just changed the color to pink, added a few items I had picked up for our game and printed during my lunch break. Much appreciated! When ever I download it and try to print it freezed up and won’ t let me print. Can you email it to me please. This is very cute and exactly what I am looking for. I have been able to edit the list, but can’t seem to figure out how to edit the tags. Can anyone assist me? I’m hosting a baby shower in less than 12 hours and this is wonderful!!! Thank you so much for sharing this! Thank you for the free download! It is perfect for my sister’s baby shower in July. OMG for the last hour I have been searching for something like this. Thank you so much this is awesome. This was the best design I’ve seen so far! Great job and thank you for sharing. How can you edit the tags? I got the game boards filled out but the tags wont edit. I Picked up 12 items today for this game but the the sheet only has space for 10. Can you please send me a version with 12 lines?? This is so perfect, thank you so much for posting this!!! Hi! Help! Great post, however, I can’t get the editable files to open. Can you please help?